OfferCrowd is an adware application that seems to come along with a number of attractive offers. It says that it can offer you many deals based on your current web browsing session. On the other hand, this should be enough to raise your level of suspicion, because, if a program bases something on your web browsing history, this means that it tracks the websites you visit. It certainly presents particular security issues that you should not ignore. It would be best to remove OfferCrowd from your computer at once to ensure your system’s safety. If you were to open the official website for the application at offercrowd.com, you would see that the application is promoted as a tool that shows you “relevant deals and offers when you fill out forms online.” OfferCrowd is said to help you save money, but it is very unlikely that the program can provide you useful information. On the contrary, OfferCrowd might be exploited by malevolent third parties to promote online marketing schemes and even malware. For example, if you click the Free Download button on the main website, instead of downloading the application it redirects you to yet another website that asks you to fill out a web survey. During our tests, one redirection followed another, and, if we tried closing the webpage, we received a pop-up that urged us to “stay on page.” Eventually, we were redirected to an aff.rintonepartner.com advertising page that asked if we wanted to install the iLivid application. It said that with iLivid we could download videos faster. It is obvious that OfferCrowd is closely related to a number of adware and potentially unwanted software applications, because iLivid is one of those programs you wouldn't want to have on your computer. Also, we can see that it is not possible to download OfferCrowd directly from the official website. Hence, the adware most probably employs bundled downloads as one of its main distribution methods. This also means that OfferCrowd enters your computer together with other unwanted applications. Although it does not add any extensions to your default browser, the program continues to run in the background of your system, and you can find its process file (OffercrowdSvc.exe) on the list of currently running processes via Windows Task Manager. It is more of a nuisance than an actual computer security threat, but it would not be a good idea to keep this program on your PC. Therefore, open Control Panel and uninstall OfferCrowd manually. When you are done with manual removal, make use of the SpyHunter free scanner to scan your computer and remove any remaining unnecessary applications. For any further questions, please leave us a comment. Open Uninstall a program and remove OfferCrowd. Go to Uninstall a program and remove OfferCrowd. 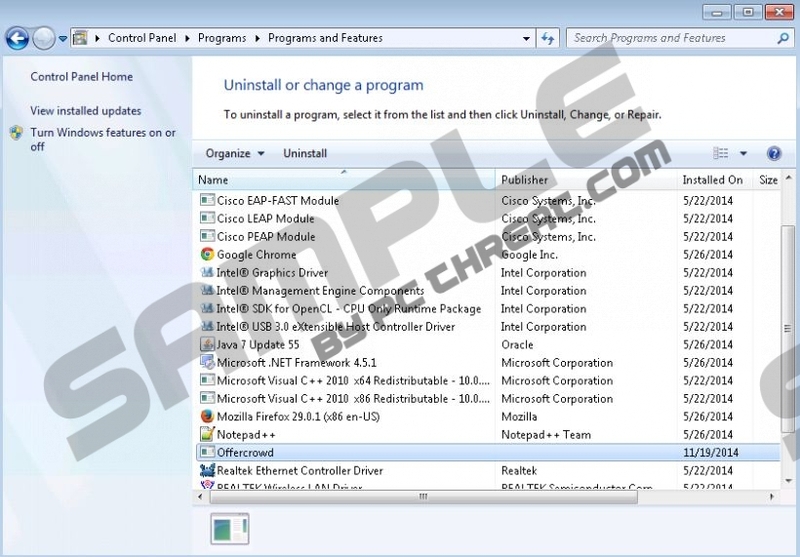 Select Add or remove programs and uninstall OfferCrowd. Quick & tested solution for OfferCrowd removal.